Please note: The Bureau of Kind Objects is closed. We’ll pop it back up in November 2017. What is a kind object, you ask? It’s an object that, through time and location, has been imbued with good, supportive energy. As a perpetual vintage shopper, I pick up and put down things, feeling their energy and buy things that feel really good. These days, it feels like everyone needs something kind. 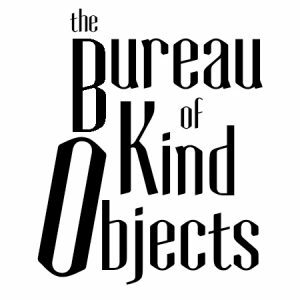 I announce the opening of the Bureau of Kind Objects! I have gathered many kind objects and I would like to match the kind object to the person who would most benefit from the unique spiritual energy of that object. I wish I had the deepest of pockets and could just send them out into the world. I can’t do that for everybody (though see below for the EKO (emergency kind object) program). You pay for a kind object, I send you one. Whether you want to pay $5 or $250 (or various points in-between), I have an object that’s got the specific kind energy that you may need. Your object will be specifically chosen for you from my vast collection of kind objects. It will come with a tag that explains the origin, age and kind nature of the object. It will also come with directions for using the object. If I do not have an object that is the right fit for you, I will seek it out. The objects are vintage or handmade. They are wearable, or functional or, on rare occasions, art. Your object could be a trinket or a talisman, or a bowl, or a tea cup, or a spoon. It could be something entirely different. A $5 object will fit in your pocket. The price of the object doesn’t make it more spiritual. An object with a higher price point may be more rare or just cost more to acquire. Please note: There is no return/refund for the object (but if it arrives broken, please let me know). If you live in the US, postage is included in the cost of the kind item. International items may incur a postage charge. It will be exactly what the postage costs me. For example, most $5 objects cost about $9.50 to mail to Canada (meaning, your total for a $5 is $15ish). It’s $13.50 to the UK. You can also send a kind object to a friend. Just pay for the kind object and send me an email telling me what to do. My email address is bp@bridgetpilloud.com . If you are in a very bad financial situation, and need a kind object, but can’t pay for one, please send an email to me at bp@bridgetpilloud.com . The Bureau of Kind Objects will be open for four weeks, starting today. We will stop taking orders on December 13th. You can expect your item to arrive about 10 days after you order it! Please choose a button, below, to add a kind object to your shopping cart. You may buy as many as you like. Hey Bridget, I’m not a frilly, frou frou woman. I can hardly wait to see what you select! Many thanks. We’ll see what pops up, Lana! There was no place for me to add my note at checkout, so I’m adding it here. 🙂 You know me fairly well, but I think the comment that comes to mind is that I feel like a woman very much at a crossroads, a woman in transition. It feels like chaos. It feels like an increase in anxiety. It feels like being unwilling to compromise or accept B.S. any longer. It is not a place I am enjoying, but I am trusting that the chaos is a necessary part of the journey to whatever is waiting for me on the other side. It feels like I’m in the chrysalis, waiting to emerge from the cocoon. Leveling up. Can’t wait to see what you pick for me! I need to fix my buttons! Your kind object has this support system in spades. I just wrote your note, before seeing this comment and I have goose bumps for how dead right on your object is! I am so excited for you! Hi Bridget! I didn’t see a place to add a note at checkout, so I thought I would write one here in the hopes that you’ll see it. What I feel led to tell you is that I’m having a difficult time right now, dealing with a lot of upcoming transition and change that I’m not feeling ready for. I’ve always been an anxious person, but I’ve been having a lot more anxiety lately as I deal with these upcoming changes in my life and having to operate outside of my comfort zone a lot of the time. As scary as it is right now, I feel so aware of how blessed I am to have loved ones around me that are supportive and kind; I’ve never felt such a deep gratitude before, and I’m so thankful for it. I’m still very much afraid of the unknown, but I also find peace and contentment in the knowledge that, no matter what happens, the universe will place me where I need to be. Hannah- I have something for you that fits perfectly. Transitions are very hard and then they happen and we get through. Hi, Bridget — I also placed a BOKO order. I think what comes to mind is that I think of myself as fairly earthy, and lately I’ve been getting lots of little messages/clues related to trees, specifically willows. Thank you! So good to see your face. I need to see what calls me for you. Oh, Bridget – it is so good to see *your* face – you’ve been missing from my Inbox for what feels like a half-of-forever! My life lately has been chock-full of changes and stretches, and I only want to ask for your Blessings, and a long-distance hug.